James Cowie was born in Aberdeenshire. He spent thirty years of his life teaching art; at Bellshill Academy, Lanarkshire, at Hospitalfield near Arbroath and finally at Gray's School of Art in Aberdeen. His working methods were studied and meticulous and he produced works of a restrained, classical nature. This 'Still Life' includes two Tanagra figurines which, when juxtaposed with other objects and positioned in front of a landscape seen through a window, create a surreal effect. The atmosphere he has created is not unlike that of the works of Italian Surrealist, Giorgio de Chirico. 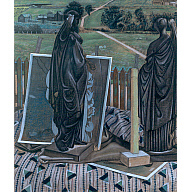 Purchased in 1980 with assistance from the National Fund for Acquisitions. Girl holding Drapery - Study for "Two Schoolgirls"